Skol Brewery Limited (SBL) is proud to announce the launch of a new beer on the Rwandan market – SKOL LAGER. This exciting new beer will complement our successful Skol 100% Malt, and contribute to the growth our brands portfolio that includes Gatanu and Virunga Mist. Skol Lager will be available in a 50CL brown bottle at the cost of 600 Rwf nationwide. With Skol Lager consumers can expect to enjoy a smooth, crisp, refreshing and easy drinking Lager beer. Skol brewery Ltd is a subsidiary of Belgium based UNIBRA, a company with interests in Breweries, Real Estate and Financial Services. The company was founded in Rwanda in 2010 with the goal of capturing 20% of the beer market in five years and is now one of the fastest growing companies in the country. The word Skol comes from ancient Viking warriors in northern Europe. Skol in modern times has come to mean “CHEERS!” in very many European countries. In 1964, four Brewing Companies combined resources to form a “COCA-COLA” of beer arround the world. UNIBRA controls the rights for Africa. 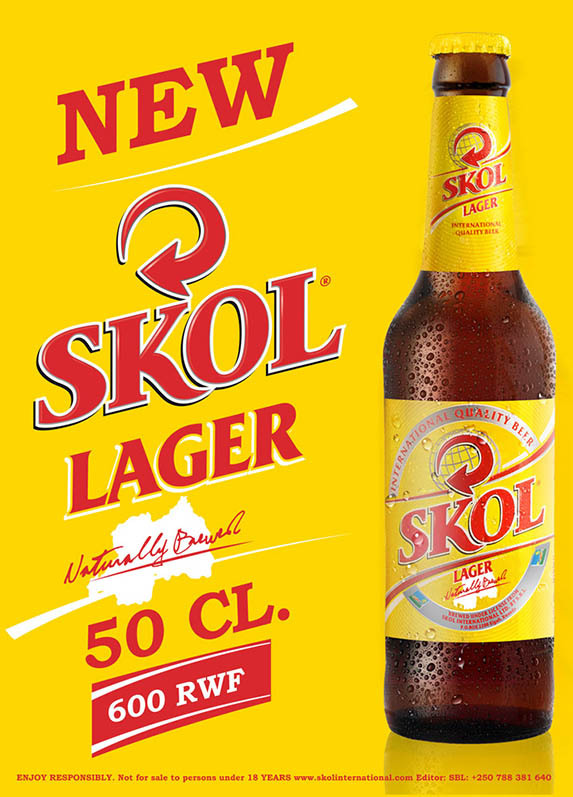 Skol happens to be the biggest beer in Brazil and one ofthe top four beer brands arround the world in terms of volume sold. UNIBRA has had brewing operations in Africa since the mid twentieth century. The brewery has a long history in the Democratic Republic of Congo, with the iconic TONTON SKOL. Today Skol can be found in more than 10 African countries. In 2013 SBL embarked on a consumer research process to understand Rwandan beer consumers’ tastes and habbits. The goal was to find out characteristics of beer appreciated by most Rwandans. The results proved that most Rwandans like smooth, crisp, light easy drinking beer. We then designed a recipe to suit this pallet and we are proud to offer SKOL LAGER. Skol Lager is packaged it in a modern looking bottle with yellow labeling to reflect our brand values of fun, young, energetic, social and bright optimism. This is why we plan to base the launch advertising campaign on a platform of SOCCER and BRAZIL. To promote the new Skol Lager we have planned to conduct over 800 bar activationsnationwide to enable people to sample or try the beer. In addition we plan to do a back label collecting campagin. Each Skol Lager will have a special back label depicting a country that has won the world cup in the past. Consumers will be encouraged to take pictures of these backlabels and post them on our facebook page (www.facebook.com/skolrwanda) . The photos that get the most likes will win prizes every week including balls, sunglasses, watches, etc). It is our desire to Connect Skol with Soccer fans to leverage Skol BRAND awareness and usage. It is also our ambition is to contribute to the growth of Football in Rwanda by Sponsoring Rwanda’s most popular soccer team – Rayon Sport F.C. We hope to contribute towards it’s success not just in Rwanda but in the East African Region. We dedicate Skol Lager not just to Rayon Sports Football Club Fans; but to all fans wherever they may be, whatever sport they like, anywhere, anytime.